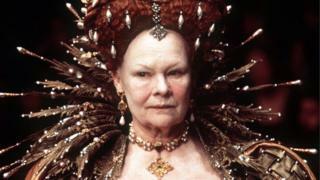 Lovers of Shakespeare have long made pilgrimages to Stratford-upon-Avon and the Globe theatre in London. Now, Prescot in Merseyside is building a replica Elizabethan theatre in the hope of becoming the third point in a “Bard triangle”. That’s despite the fact there’s no evidence that the playwright visited. 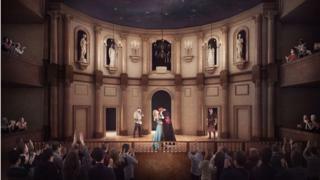 But Prescot did have the only purpose-built Elizabethan theatre outside London, and work on the recreated version is due to begin this summer. The 350-seat Shakespeare North Playhouse will feature a faithful timber candlelit theatre inside a modern shell, which will also include classrooms and an exhibition area. It is being built on an old car park at a cost of more than £20m and is due to open in 2020. Prescot’s original playhouse was built in 1593 – around the time the Bard wrote Richard III – possibly as a base for actors who had left London when theatres were shut during the plague. “It’s very hotly contested and there’s lots of reasons for thinking he might have [visited], but no evidence at all,” says Ian Tabbron, interim chief executive of the Shakespeare North Trust. The original theatre is thought to have been built with the backing of the Earls of Derby, who lived at nearby Knowsley Hall. They sponsored an acting troupe called Lord Strange’s Men, who performed some of Shakespeare’s earliest plays. Mr Tabbron says: “There’s a good logic and rationale for looking to construct something to honour Shakespeare in the north-west. No designs of the original Prescot theatre have survived, so the new version is being built to plans for a court theatre drawn up in 1629 by architect Inigo Jones. “I’m hoping the atmosphere will be quite magical,” Mr Tabbron says. “It won’t be lit by candlelight all the time – there will also be the opportunity to use modern technology. 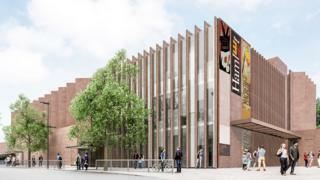 And some of the timber could come from the replica Elizabethan theatre that was built for the 1998 film Shakespeare In Love – which Dame Judi Dench, who appeared in the film and is one of the new venue’s patrons, donated to the Shakespeare North Trust in 2009. Other patrons include Vanessa Redgrave, Dame Helen Mirren, Sir Paul McCartney and former Prime Minister Gordon Brown. The film set is currently in storage in eight shipping containers on the Knowsley Hall estate, which is also home to Knowsley Safari Park. “I think it’s guarded by lions and tigers and we keep the insurance down,” jokes Professor Kathy Dacre of Rose Bruford College in London, who is chair of the Shakespeare North development board. Prof Dacre grew up “a stone’s throw” from the theatre and says the priority is to improve the area’s fortunes through jobs, training and tourism. 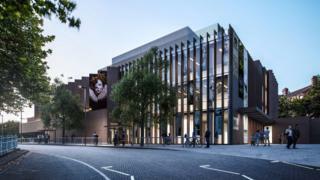 Education will be a major part of the mission – the venue will be the base for a master’s degree in Shakespearean performance as well as a schools programme. Unlike the Royal Shakespeare Company in Stratford and the Globe, it will not create its own productions, instead hosting visiting companies. 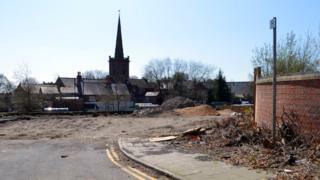 Of the Shakespeare North funding, £5m has come from the government and £6m from Knowsley Council. The last time the government published research into the most deprived boroughs in England, in 2015, Knowsley came top of the lists for people in low-income households and for low employment. Ian Tabbron says the playhouse plan is at the heart of a wider regeneration scheme, and has already started encouraging local entrepreneurs. A Shakespeare-inspired micropub named The Bard Prescot opened in February, and a Shakespeare-themed hotel is also in the works. “I’m sure people will be sceptical about why what appears to be a high-end artistic elitist palace should be built in a place which has many challenges,” Mr Tabbron says. “Knowsley has many challenges. “But, actually, if you look into the vision and objectives for this project, everything is about inclusion and everything is about inclusive growth for Knowsley. And we will be using the research that we’ve done to set targets for inclusion. 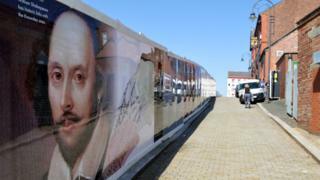 Meanwhile, a temporary replica Shakespearean theatre is being built in York this summer. The pop-up 13-sided Rose Theatre will hold 950 people and will be in place for 10 weeks from 25 June. A company of actors will perform four plays, including Romeo and Juliet, which will star Versailles’ Alexander Vlahos as Romeo and The Musketeers’ Alexandra Dowling as Juliet. .Follow us on Facebook, on Twitter @BBCNewsEnts, or on Instagram at bbcnewsents. If you have a story suggestion email entertainment.news@bbc.co.uk.